With a record 110 Michelin-starred restaurants – representing a 30% increase since 2010 – Switzerland is hot on the heels of its gastronomic neighbours when it comes to high-end eateries! Historically, Swiss menus have largely been influenced by French, German and north Italian cuisine, with each “cantons” adding its unique twist to Alpine recipes passed down over the ages. And, as you’d expect in Switzerland, attention to detail is first class, quality of ingredients second-to-none and service in restaurants spot on! Let’s start with breakfast in the Bernese Oberland where, historically, potato rösti was the first meal eaten by Bernese farmers to kick start the morning. In the modern day Alps, these fried potato patties – sometimes filled with bacon, onion, cheese or even apple – are more likely to appear as a side dish on lunch menus, however in the high mountain villages they are still considered a breakfast staple and are often eaten with fried eggs, spinach and a sausage meat called fleischkäse. A more health-conscious breakfast option is birchmuesli – a mix of rolled oat flakes, fruit, nuts, lemon juice and condensed milk – invented in Switzerland in 1900 by a Dr Maximilian Bircher-Benner and known today throughout the world as muesli. Continental breakfast is as popular in the Swiss Mountains as anywhere else in Western Europe. There are many types of bread on offer too but one of the most popular and delicious is a soft white loaf called zopf. You’ll be able to recognise it easily because it’s plaited (the word zopf means ‘braid’), with a golden crust, very much like the Jewish bread called challah. Some say it originates from an ancient custom of widows cutting off their braids and burying them with their husbands, and it’s traditionally eaten on Sunday mornings. 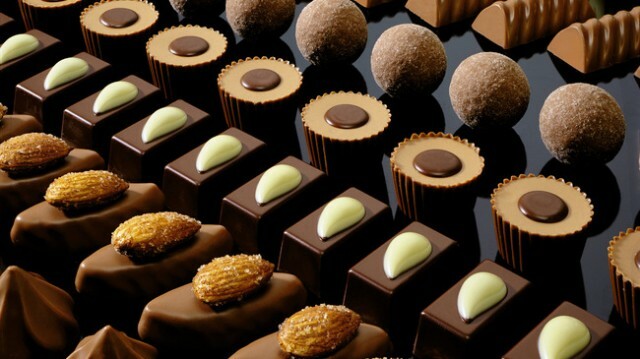 Switzerland is, quite simply, chocolate heaven, and no mid morning coffee would be complete without a chocolate or two! After a morning’s walking or cycling in Switzerland, you’ll be ready for lunch – and, don’t worry, portions are big here! 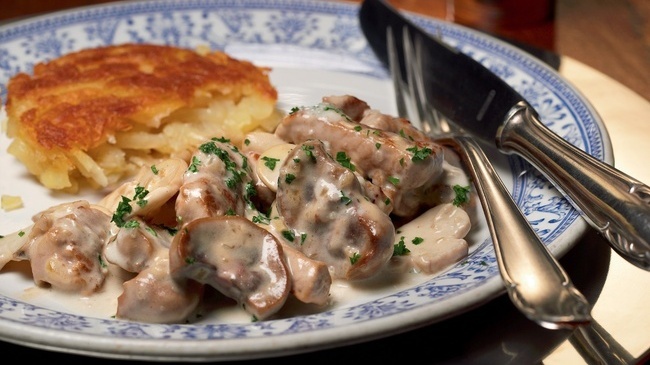 One of the most traditional dishes is alplermagronen – also known as “herdsman’s macaroni” – a traditional all-in-one lunchtime plate from German-speaking Switzerland. Made from hearty mountain ingredients – potatoes, onions, cream and apples – the classic version layers cooked potatoes and macaroni with cream and cheese, before baking it in the oven and serving with fried onion rings and a stewed apple sauce on top. The posh version has bacon added too! Saffron is grown in the Swiss canton of Valais where our Goms Walk is based. This pungent spice is an essential ingredient of a traditional Ticino dinner often served with a luganighe sausage, a raw sausage made with pork, spices and red wine. Saffron risotto often appears on menus and is made from risotto rice cooked slowly with onions, stock, saffron threads, wine and cheese. As such, it is a popular choice with vegetarian guests. If you like meat, however, and are feeling very hungry, then you’ll love the Bernese speciality the Berner platte (‘Bernese platter’). It consists of a whole range of meats and sausages, which may include beef, ham, smoked bacon, smoked beef and pork tongue, spare ribs, pork loin and shoulder, marrow bone­­ – oh and there’s some juniper-flavoured sauerkraut, potatoes and dried beans in there, too! The dish was created on 5 March 1798 after the Bernese defeated the French army at Neuenegg. To celebrate they held a huge feast, with everyone bringing along whatever they had to hand, hence the variety and prominence of preserved meats and other similar foods. Delicious Zürcher Geschnetzeltes – veal, sliced into small strips, served with sliced mushrooms and cream. Raclette is the name of a Swiss cheese made from cow’s milk (slightly nutty, a little like gruyère) but it’s also the name of a very popular meal originating from the Upper Valais. In the old days, an entire wheel of cheese was held up in front of a fire and as the cheese melted, it was scraped off onto a plate to be eaten. The name is derived from the French racler, meaning ‘to scrape’. Today, slices of raclette are melted in table-top raclette pans or grills, and usually accompanied by small potatoes cooked in their skins, vegetables, charcuterie, pickled gherkins and onions, and bread. With a modern raclette grill, you melt the cheese on one layer and can scrape it over the grilled vegetables and meats. To round off a meal – and if you have room! 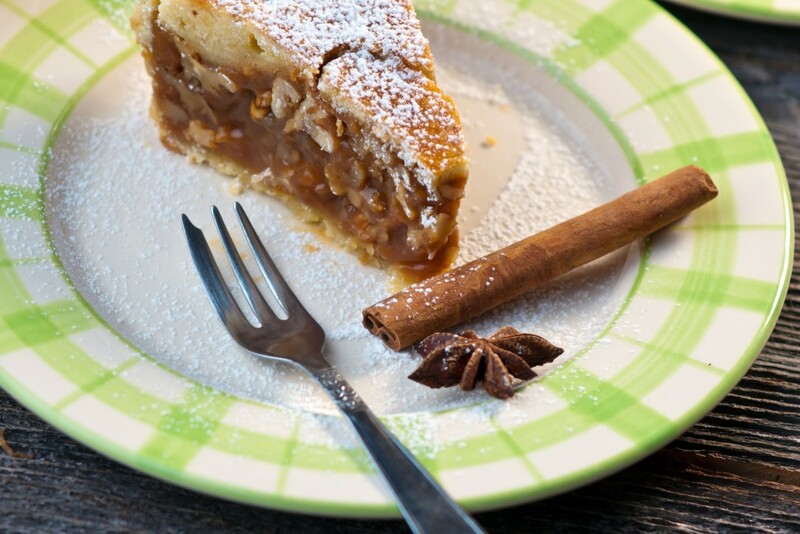 -the bundnernusstorte, sometimes called an engadinernusstorte, is a yummy caramelised nut-filled pastry originating from the canton of Graubunden. It’s made in small independent bakeries all over the canton, each of which have their own variation on the basic recipe of short-crust pastry made from flour, sugar, egg, butter and salt with a filling of caramelised sugar, cream and chopped nuts, usually walnuts. Engadine walnut cake is one of the gastronomic icons of Graubünden, a Swiss culinary classic that is exported all over the world. Although Switzerland is unlikely to ever enjoy the recognition of France or Italy when in comes to fine wines, certain regions do produce some very acceptable vintages, with the vineyards around Neuchatel, in the country’s French-speaking Three Lakes region perhaps the most interesting. For reds, the pinot noir grape predominates, whilst the most popular whites come from chasselas – the nation’s most widely planted white wine grape – followed closely by chardonnay and pinot gris (known here as malvoisie). Neuchatel’s own curiosity is the Oeil de Perdrix, a pale-pink rose wine, typically dry in style and made from Pinot Noir. The name means ‘Eye of the Partridge’, a reference to the pink hue of the bird’s eyelids. Whether the style was originally invented here or in Champagne is not entirely clear, but what is certain is that Oeil de Perdrix wines have been the specialty of Neuchatel from the Middle Ages until the present day. 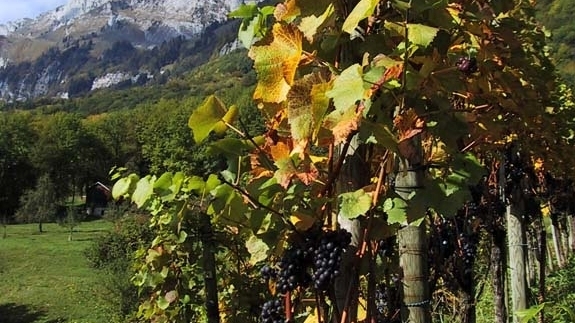 Swiss vineyards give a large choice of grape varieties, although they are still scarcely known abroad. We hope that our gastronomic pit-stop guide to Switzerland has whetted your appeitite for a holiday here this summer! Our carefully planned walking and cycling holidays in locations all around the world let you explore at your own pace, with time to take in the local culture, history and nature along your route. Hand-picked family-run accommodation provides welcoming comfort at the end of each day, with every hotel and guest-house being chosen for its friendly atmosphere, delicious food featuring regional specialities, and unique character.